Bedtime is a time when kids get to unwind, they relax and they drift to sleep into the next day. Bedtime can also be a high anxiety time, a time when all of your child's biggest fears show up simply from their imagination after the lights are out. I know my son has never liked sleeping without a light of some kind on. Usually it is the hall way light which ends up disturbing his sisters and keeping one of them awake. Asking him time and again why he needs the light has the same answer - he's afraid of the dark and has been since he was quite little. The hallway light has had a lot of action! We have tried different kinds of night lights. To me, having something plugged into the wall and running all night is asking for a disaster so we usually turn to battery operated night lights. Cloud B brings families like ours a relaxing, new way to get little ones with night time fears to sleep with the Cosmic UFO. This isn't just your ordinary UFO, it's built specifically to trigger certain senses to calm anxious kids like my boy to sleep and help him get past those fears of the boogie monster in his closet by basically keeping his mind on something else. 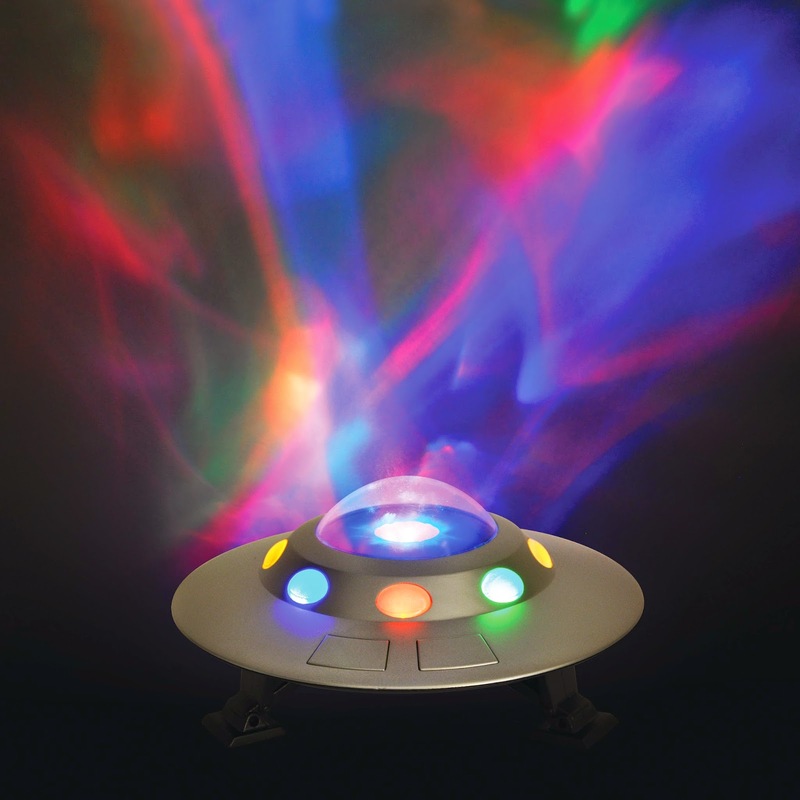 Cosmic UFO combines both sight and sound features with moving projections of the Northern Lights to create an intergalactic atmosphere, transforming any child's room into a personalized planetarium. Cosmic UFO features three soothing sounds: White Noise, Melody, and Lift Off.n It has adjustable settings for brightness and movement create a fully controllable experience. A 23 minute timer ensures complete darkness and silence during the child's deep sleep cycle, recommended by pediatricians. For someone like my son this would make a perfect gift because it's battery operated and can be placed on the shelf or desk in his room. I like the fact there is a timer so the device is not running all night long. The effect is very nice and I can see us making the Cosmic UFO part of our bedtime routine with our little guy. Cosmic UFO requires only 3 AA batteries which are not included. You can find Cosmic UFO for around $64.99 at independent toy, gift and baby stores across Canada. Visit www.cloudb.com/canada for more information about this and other innovative children's toys! Posted on behalf of Cloud B. Complimentary product received for review purposes. Opinions and comments on this blog are those of the author.